Each year the University of Georgia publishes a campus security report. This report contains information on campus safety programs as well as advice on crime prevention and the procedures to follow in reporting crimes. The report also contains statistics about crimes on campus during the last three calendar years. 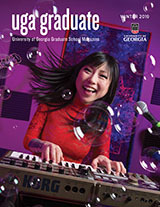 This report is available upon request from the Office of Graduate Admissions, The University of Georgia, Athens, Georgia 30602-7402, 706/542-1787. We also recommend that you review the UGA Safe & Secure Guide for more information related to campus security.